The 1911 Jeff Davis County Courthouse occupies the courthouse square in downtown Fort Davis, Texas, bounded by Court Street, Front Street, Woodward Avenue and State Street (SH 17). Surrounded by landscaping of primarily native county plants, this building exhibits features typical of governmental buildings constructed during the early 20th century. The 3-story stone and concrete Classical Revival courthouse has a rectangular plan, projecting entrance porticoes and a prominent cupola that serves as a clock tower. The building reflects a simplified classicism evident in projecting 2-story Doric porticoes that dominate the north and south elevations, an unadorned pediment, full entablature with strong cornice-line, and a symmetrical rectangular plan. The octagonal, domed cupola is characteristic of Beaux Arts classicism, with paired Doric pilasters separating arched openings and a prominent cornice emphasizing recessed round clock faces in the dome. The building is in fair condition and in need of numerous minor repairs, but it retains a high degree of integrity. Some features of downtown Fort Davis and the courthouse square have undergone significant physical changes since the early 20th century while others remain relatively unchanged. Few improvements were made to the courthouse site at the time of construction, and the square was left as a dirt yard. Although the county had swapped land to square the site, there was no clear visual distinction between it and the land surrounding it. Only a few other buildings, including the 1-story concrete block jail with a crenellated parapet built at the same time were in the immediate vicinity, and the courthouse was a dominant edifice (see Figure-18 and Figure-19). The courthouse square today has a much different appearance and illustrates the evolution both of Fort Davis and the site itself. A steel pipe fence, added c.1915, runs around the perimeter of the site with a unique turnstile entry gate centered on each side of the square. Straight sidewalks, first added in 1918, lead from each gate to the entrance centered on its respective elevation and emphasize the site’s axial arrangement, a design befitting the building’s Classical Revival style. Each sidewalk terminates at the building with a paved, semi-circular landing at the base of the steps leading to the entrance. The landings are equal in width to the building’s steps, so those at the principal entrances, facing north and south, are much larger. In order to allow for handicapped accessibility, a larger gate was added adjacent to the south turnstile, and a ramp was added to the south entrance in 1988. Abundant old-growth trees now cover the courthouse square, largely the result of a 1938 WPA project to improve the courthouse yard. The courthouse square was intended to serve as a kind of “county arboretum,” and most of the trees and other plantings are representative of the area’s indigenous species. In contrast to the building’s dominant presence in the landscape of the 1910s, it is now nearly hidden by the site’s thick vegetation. In addition to natural landscaping, the site also includes a cylindrical, concrete block cistern (c. 1900, contributing) near its southwest corner and two monuments, one to Ft. Davis’ Confederate Veterans (1956, non-contributing) and one to Manuel S. Gonzales (1997, non-contributing), both near the site’s northeast corner (see Plan-21). The growth of Fort Davis has also defined the courthouse site. The build-up of commercial buildings around the square through the 1920s established the courthouse as the town-center it was intended to be. State Street, which marks the square’s east boundary, has become State Highway 17, the county’s principle north-south thoroughfare. Nevertheless, the site has maintained a good deal of its early 20th-century character. Both Woodward Avenue to the south and Front Street, the historic “Overland Trail” between San Antonio and El Paso, to the west remain unpaved and likely look much like they did in the 1910s and 20s. Consistent basic elements unify all sides of the courthouse exterior, designed by L.L. Thurmon of Dallas and built by the Falls City Construction Company. The building’s base is defined by a poured-in-place concrete water table that extends from the slab-on-grade foundation to the sill of the first floor windows. The main parts of the exterior walls, which are recessed slightly from concrete block quoins, include alternating courses of concrete block and a rusticated, locally-quarried pink volcanic stone. The building’s painted, decorative sheet metal entablature begins just above the second story windows and is capped by a prominent cornice. A low-pitched, cross-gabled roof with pediments at each end covers the central part of each of the building’s four sides. Framed in wood, this roof was originally covered with decorative pressed metal shingles that have since been replaced with asphalt composition shingles. The four corner sections of roof left by the crossing gables were originally flat with decorative sheet metal parapets and internal roof drains, but they were changed to low-pitched sloping roofs with external gutters in 1930. The building’s most prominent unifying feature is its octagonal cupola, with an identical round clock face set in the dome above each of the building’s four elevations. The entire cupola, including its dome and rectangular base, are sheathed in painted, decorative sheet metal. The north and south elevations of the courthouse are identical, and both could be considered primary façades. The central part of each of these façades is recessed behind its most prominent feature, a projecting 2-story portico with six concrete Doric columns. The columns rest on pedestals that echo the building’s water table, raising the height of the column base to that of the first floor window sills. A wide set of concrete steps, flanked by concrete walls approximately half the height of the column pedestals, extends across the width of the four central columns and leads to the recessed entry. The sections of wall on each end of the façade outside the portico are of the building’s characteristic construction type, with alternating courses of concrete block and stone. Each end includes two double-hung 1/1 metal windows on both the first and second stories, although the first-story windows are slightly taller. A slightly recessed, rectangular concrete panel defines the area between the two floors. The recessed wall in the portico is constructed of concrete block only. A pair of hollow metal doors, which were used to replace all original exterior doors in 1972, is centered on the wall. The transom above the doors, divided by a single vertical muntin, extends the opening to the height of the first-story windows. A pair of double-hung 1/1 metal windows flanks each side of the central entry. On the second-story, a double-hung 1/1 metal window is placed directly above each of the four first-story window openings, with a double window above the entry doors. The heads of these windows, which are taller than the second-story windows on the outer ends, are hidden behind the building’s entablature. The pediment spanning the portico is simply detailed, with a single round louvered vent opening in its center. The narrower east and west elevations are nearly identical. Each is defined primarily by a set of four Doric concrete block engaged pilasters spanning the central part of the elevation. Besides the pilasters and quoins, the walls are built with alternating courses of block and stone. Each of the two end sections, outside the pilasters, includes two double-hung 1/1 metal windows on the first floor, with a recessed concrete panel that matches the openings’ size and shape between the two. On the second floor, there are three windows, one over each of the first floor windows and a third over the concrete panel. As on the outer bays of the north and south façades, a recessed rectangular concrete panel defines the area between the two stories. The areas between the pilasters are detailed similarly, with recessed rectangular concrete panels separating first and second story openings. Between the two outer pilasters, there is a single 1/1 window on each floor. The entry is between the two inner pilasters, centered on the elevation, and varies slightly on the east and west sides. Both elevations include a set of concrete steps, again flanked by shorter concrete walls, that are the width of the section between the inner pilasters. Both also include a pair of hollow metal doors typical of the existing exterior. On the west elevation, a divided transom, like those on the north and south entries, is over the doors, with the typical recessed concrete panel above and a pair of 1/1 windows on the second floor. The east doors enter into the main stair hall, which is reflected on the exterior. There is no transom above the doors, but a pair of 1/1 windows is midway between floors with a second, much shorter pair just above those. An unadorned pediment projects slightly out from the wall above the pilasters on both the east and west elevations. The two chimneys that would have once been visible on each elevation have been removed. The first floor of the courthouse is arranged in a cross-axial plan with two central halls connecting the four entrances (see Plan-22). Various offices, a county courtroom, and a vault are arranged along the perimeter. The main stair at the east end of the building consists of two divided stairways that meet at a central landing and continue up on a much wider stair. The district courtroom occupies the entire central part of the second floor’s H-plan, with offices and storage rooms in the outer wings (see Plan-23). In 1956, the courtroom’s original railing was replaced and a dropped acoustical tile ceiling was added below the original pressed tin, blocking the original skylight. The stairs continue to a third floor that has lost a good deal of its purpose. It originally provided access to the courtroom’s balcony, which was also removed in 1956. The twelve art glass windows that once opened onto the flat-roofed corner sections were covered by the added sloped roofs, and all but three have been removed. Most of the original interior hardware and millwork remains in good condition, although much of the trim’s faux wood graining has been painted over. Some original furnishings also remain, especially on the first floor. The district courtroom’s judge’s bench, jury and witness stands were all replaced in 1956. Some of the original longleaf pine floors remain, but most have been covered with carpet or oak flooring. Despite some alterations, much of the courthouse’s original material remains intact and in good condition, lending the building integrity of materials and workmanship. The exterior has undergone only minor changes, and remarkably few changes have been made to the interior partitions, so it also retains integrity of design. The building’s continued use as a courthouse maintains its integrity of association. Although the building has always been in the center of the courthouse square and undeniably maintains its integrity of location, its surroundings have changed significantly since the building’s construction. Nearly all of those changes, however, occurred within the period of significance, and as the square and downtown Fort Davis maintain many of their early 20th-century characteristics, the courthouse retains its integrity of setting and feeling. 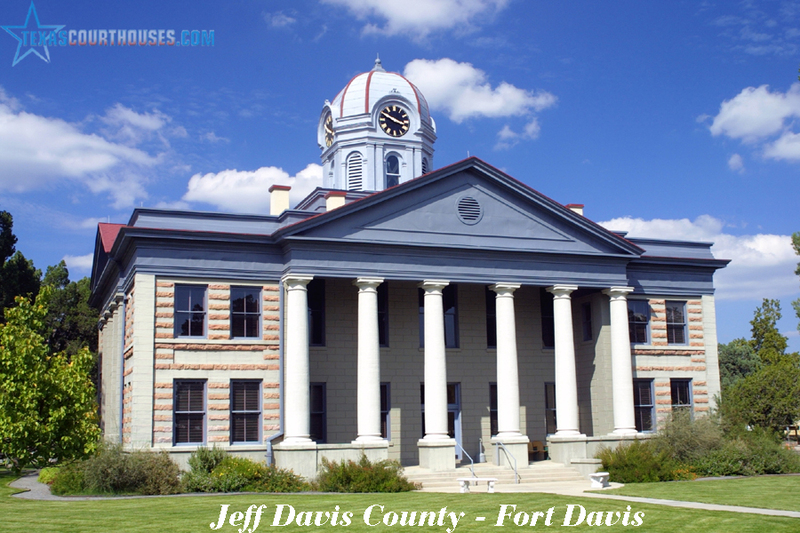 Although the area of Jeff Davis County initially developed around an important trade and travel route of the western frontier and the military post of Fort Davis established to protect it, the 1911 Jeff Davis County Courthouse was emblematic of the county’s newfound prosperity in an economy based on agriculture and tourism. It also represents the regained importance of the town of Fort Davis as the county seat and center of this new economy. Designed by L.L. Thurmon, the building is also an excellent example of an early 20th-century Classical Revival courthouse, as adapted to the smaller and less wealthy counties of rural Texas. It is nominated under Criterion A in the area of Government and Criterion C in the area of Architecture, both at the local level of significance. Jeff Davis County lies in the Davis Mountains of west Texas’ Trans-Pecos region. The county seat, Fort Davis, is at the base of the mountains, at the intersection of State Highways 17 and 118 in the southeast part of the county. Despite limited Spanish exploration in the 16th and 17th centuries, the remote area was primarily inhabited by nomadic Native Americans, especially Mescalero Apaches, until the middle of the 19th century (Kohout 1996b: 3:922; Jacobson and Nored 1993: 1-10). After the Mexican-American War, the United States was intent on opening up the new western territories to settlement and sent army explorers and surveyors into the area. By 1849, the “Lower” or “Military Road” had opened from San Antonio to El Paso, passing through today’s Jeff Davis County. The road, which was incorporated into the Overland Trail, was both a primary route for “Forty-Niners” and subsequent California emigres and an important freighting trail from Indianola, on the gulf coast, to Mexico and beyond. To protect the road’s travelers and freight, the federal government established army posts along the Military Road, including Fort Davis (NHL 1966) in 1854. A small community of civilians, Chihuahua, grew up outside the fort proper. A little farther from the fort’s walls, the community of La Limpia was also emerging around a Gidding-Skillman stage stop founded in 1854 (Kohout 1996b: 3: 922; Jacobson and Nored 1993: 11-54). Recognizing this new growth, the Texas legislature sought to define and organize the region, which was still merely an extension of the vast Bexar County. In 1848, the legislature created Santa Fe County, stretching from the Pecos River west to the Rio Grande, in present day New Mexico, and extending as far north as present day Wyoming. In January 1850, Santa Fe County, which had already been reduced considerably in size, was divided to create the additional counties of Worth, El Paso, and Presidio, the latter of which included most of Texas’ Trans-Pecos region. Over the next few decades the Texas legislature made several attempts to organize Presidio County, with little result. Although Presidio del Norte was designated as the county seat in 1858, most of the county’s business was conducted in El Paso until Presidio County was officially organized in 1875 (Kohout 1996b: 3: 922; Jacobson and Nored 1993: 11-34, 91-94; Gournay 1995: 61). The Civil War brought a good deal of dislocation to the Trans-Pecos region. With the outbreak of war in 1861, Fort Davis was surrendered to Confederate troops with no resistance, but hostile Mescalero Apaches forced the Confederate troops out, along with most of the area’s citizens and ranchers. The fort remained abandoned throughout the war but was reoccupied by federal troops in 1867 and enlarged. Indian hostilities made the protection of the Military Road even more important than it had been before the Civil War, and Fort Davis became the center of operations against the Apaches (Kohout 1996b: 3: 923; Jacobson and Nored 1993: 11-54). In 1871 the Texas legislature split Presidio County, creating Pecos County to the north and east. In 1875, Presidio County was finally officially organized and operational, and the town of Fort Davis was selected as county seat (Jacobson and Nored 1993: 91-94; Gournay 1995: 89, 61). The town of Fort Davis, which grew out of the Chihuahua and La Limpia settlements, was the area’s most important community in the 1870s and a logical choice for the county seat. It was a trade and market center for the fort and surrounding ranches and an established stop on one of the state’s most important trade and travel routes. In the 1880s, the importance of Fort Davis began to fade. In 1883, due in part to the success of army troops at the fort in quelling Apache hostilities, the Southern Pacific railroad completed its line through Texas. Avoiding the Davis Mountains, the rail line bypassed Fort Davis, stopping instead at the new towns of Marfa and Valentine to the south and west, respectively (Kohout 1996b: 3: 923; Jacobson and Nored 1993: 105-136). In 1885, the Tenth Cavalry, a legendary regiment of “Buffalo Soldiers” and the principle military force in west Texas, was reassigned to Arizona, signaling the beginning of the end of Fort Davis’ military post. Spurred by the town’s waning significance, more than 100 county residents petitioned the Commissioners Court in May 1885 to move the county seat. In the ensuing election, Marfa was chosen as the new Presidio County seat by a difference of 89 votes (more than 12 percent of the 693 total votes). Fort Davis did not give up without a fight, and an ex-Texas Ranger eventually had to persuade the county treasurer to give up the county’s fiscal records and funds (Jacobson and Nored 1993: 134-135). After the relocation of the county seat to Marfa, Fort Davis residents no longer wanted to be associated with Presidio County and petitioned the legislature for county status of their own. As a result, on March 15, 1887, Jeff Davis County was created from the northern portion of Presidio County (Map-17). The new county was organized on May 24, 1887, and Fort Davis was once again designated a county seat (Kohout 1996b: 3: 923; Jacobson and Nored 1993: 158; Gournay 1995: 110). Despite the separation, Presidio County’s government felt that Jeff Davis County taxpayers were still obligated to help pay for the 1886 courthouse built in Marfa. In litigation that lasted from 1889 to 1899, the two counties sought to resolve the issue. The state’s highest court finally ruled that Jeff Davis County was indeed responsible for a portion of the debt, and the county paid almost $34,000 to Presidio County in May 1901 (JDCCCM I: 96-537 passim). Although Fort Davis had regained county seat status, it was further strained by the gradual abandonment of the military fort. The fort had little reason to exist after Indian hostilities were resolved, and it slowly declined during the 1880s until ordered abandoned in 1891 (Kohout 1996b: 3: 923; Jacobson and Nored 1993: 105-136). The town followed the fort’s decline, and from 1885 to 1896 the population fell from about 2000 to 500. By the turn of the century, however, the town and county had begun to recover. Cattle ranching was well-established and the area’s apple orchards were gaining national recognition. The mild summer climate and nearby rail access also made Fort Davis and the Davis Mountains a popular destination for gulf coast families. A 1904 court ruling on the county’s disputed boundary with Presidio County included the rail town of Valentine in Jeff Davis County, further enhancing the county’s economy (Kohout 1996a: 2: 1098; Jacobson and Nored 1993: 173). With prosperity returning, it is little wonder that the county began to think about a new courthouse. They were still using the adobe courthouse built for Presidio County in 1880. The original, U-shaped building, probably had only three rooms. The jail was an underground cellar, accessible through a trap door in the guard room, with narrow window slits at the top of the wall and six iron rings for chaining prisoners (Jacobson and Nored 1993: 96). As early as 1883, the Presidio County Commissioners had considered building a new courthouse, but bids for a new two-story building were rejected. They did approve bids for additional rooms for the jail and clerk’s office, but only five jail cages appear to have ever been added. In 1888, soon after Jeff Davis County took over the adobe courthouse, the Commissioners Court ordered repairs and changes made to the building. An adobe vault was built “in the unused room of the courthouse that opens into the S. W. corner of the courtyard.” Two brick flues were also constructed, and stoves were purchased for the jail, court room, grand jury room and sheriff’s office (JDCCCM 1: 59-60, 90). Photographs after the turn of the century show the old courthouse with pitched roofs and plastered or stuccoed exterior walls, most likely additional repairs made to protect the adobe walls (Jacobson and Nored 1993: 96). It seems that few would have contested Jeff Davis County’s need for a new courthouse, but their needs may have been delayed by their court-ordered contribution to Presidio County’s courthouse. By 1910, however, the adobe courthouse was nearly unusable. The roof had had numerous repairs, and the jail facilities could not be used at all. On May 30, 1910, the Commissioners Court met with Dallas architect L. (Leslie) L. Thurmon. A Louisiana native who had also spent time in Georgia, Thurmon practiced out of Dallas from approximately 1910-1915, during which time he designed several county courthouses in Texas. Before being commissioned by Jeff Davis County, Thurmon had already designed courthouses for Mason (1909-10) and Kinney (1910) counties, and he went on to design courthouses for Floyd County (1911), and Franklin County (1912). Although Jeff Davis County was physically isolated from much of Texas, the architectural style that Thurmon and the commissioners chose for the new courthouse was extremely popular throughout the state and the nation. The Classical Revival style was perhaps introduced in Texas with the construction of the new state capitol (1882-1888), and the 1893 world’s fair made it even more popular for public buildings throughout the country. Robinson (1983: 200) noted that counties were particularly attracted to “colossal columns, wide entablatures, stately pediments, and spacious rotundas, all inspired by ancient Roman or renaissance architecture. Classicism provided impressions of dignity and grace, of elegance and distinction, all meaningful to the people who build new public structures.” The interiors, as well, were meant to reflect their high purposes with rotundas and stained glass. Tarrant (1893-1895), Harrison (1899-1900), McLennan (1901-1902), Fort Bend (1907), and Harris (1908-1910) counties built some of the more monumental examples of the form in Texas (Robinson 1983: 202-219). 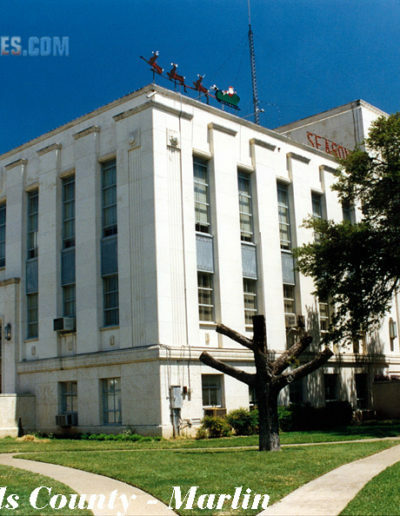 However, the style was also adaptable to smaller county facilities, including those designed by Thurmon as well as those in Bee (1911-1912), Carson (1909), San Saba (1910-1911), Hardeman (1908), and Scurry (1909-1911) counties. All feature classical columns, symmetrical proportions, entablatures, pediments and rotundas, usually expressed on the exterior by a dome or tower (Robinson 1983: 209-221). Indeed, 100 of Texas’ 254 extant county courthouses were built in Classical Revival styles during the first forty years of the twentieth century, two-thirds of which were erected before World War I. Of the pre-war buildings, the central dome was an important, almost ubiquitous design element. Sometimes true classically proportioned domes, at other times classically embellished lantern towers, the dome came to embody Republican self-government at this most local level of democracy (Henry 1993: 76, 27). All of Thurmon’s courthouses were in a similar Classical Revival style with monumental porticoes and central domed cupolas. In fact, he may even have used the same set of plans for all of them, each with modifications for specific needs and budget constraints. Jeff Davis County records indicate that the Commissioners, “agreed to build a Court House in accordance with the plan and specifications of the Court House built by (Thurmon) for Mason County, and to Cost no more than $40,000 including the necessary plumbing, and further agreed upon building a one story Jail either of rock or Cement in accordance with the ground plan of a Jail this day exhibited by the said Thurmond [sic] to cost no more than $6,000” (JDCCCM 2:140). The original drawings for the courthouse include two sets of plans. The first set, signed by Thurmon, do not include the name of the project and may be somewhat generic “courthouse” plans. The drawings in the second set are titled “Fireproofing Plans” and are labeled as being specific to the Jeff Davis County courthouse. The “Fireproofing Plans” reference Thurmon’s drawings but include changes to the structure and finishes. Several ornamental features shown in Thurmon’s drawings, including carved marble inlays for the exterior recessed concrete panels and oak paneling in the interior, were also excluded. Jeff Davis County paid Thurmon $1410 for his plans, and, on August 13, 1910, awarded a building contract for $48,470 to Falls City Construction Company of Lexington, Kentucky to erect the courthouse and jail (JDCCCM 2:140, 144-173). Although it was an out-of-state firm, Falls City Construction Company also had a history of building courthouses in Texas, including those in Carson, Rains and Deaf Smith counties (JDCCCM 2: 147-169; Robinson 1883: 218; Kelsey and Dyal 1993: 89, 210). Falls City Construction Company agreed to “furnish all material and labor, and erect complete the new County Court House and jail… in full accordance with the plans and specifications for these buildings as prepared by L. L. Thurmon and Co…. and as modified by fire-proof plans submitted herewith.” In addition, Falls City responded to a series of allowances and alternates in the original bid. The company proposed to use “twisted steel bars” as reinforcement in the concrete foundation and employ Mackey Brick and Tile Company pressed brick “from the first story sill course to the top of second story wing windows.” The company also stated that they would install 8, 10, or 12 inch courses of local stone as appropriate for an additional $1500. The company proposed to use a combination of hollow tile and concrete in the fireproof construction. The company also specified the following optional allowances from which the county could chose: electric light wiring, $425, interior wall decoration, $375, installation of roughed-in plumbing pipes, $330, installation of plumbing fixtures, $340, installation of a steam heating system, including basement for boiler and fuel room, $2000. According to the contract, the county initially accepted only the addition of the stone facing, but in December the Commissioners Court approved an additional $330 for plumbing pipes and $340 for acetylene gas pipes for lighting. 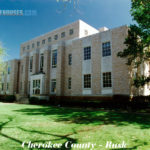 Despite the inclusion of roughed-in plumbing, however, bathrooms were not added until the county built a septic system for the courthouse in 1914 (JDCCCM 2:144-173, 183, 184; Jacobson and Nored 1993: 172). The court issued county warrants backed by a special tax to pay for the new courthouse, which included purchasing narrow strips of land on the south and east sides of the lot from Whittaker Keesey to “square up” the courthouse property, and construction began (see Figure-17). (In 1920 the courthouse and jail warrants were fully paid and the special tax discontinued.) The courthouse was sited in the exact center of the newly squared block, with the jail on a separate site to the south. The county accepted the courthouse and jail on March 25, 1911 in their first meeting in the new building (JDCCCM 1:199). The 1880 adobe courthouse was torn down soon after the offices and records had been moved to the new building. According to Jacobson and Nored (1993:173), “The dirt from the adobe walls was to be used to level the courthouse and jail yards. George McGuire offered to pay the county $50 to do the work and receive all salvageable material from the old building. McGuire built himself a house in Chihuahua with what he salvaged from the old Courthouse.” The site of the old courthouse has been disturbed very little since then, and an archeological investigation would most likely yield interesting information about the facilities and practices of 19th-century government in Jeff Davis County. The 1911 courthouse was part of a larger building boom in Fort Davis during the first two decades of the twentieth century. Several new commercial buildings were constructed in the courthouse’s immediate surroundings. The newly established Union Trading Company, a group of stockholders that purchased and expanded Whittaker Keesey’s general store, constructed a new building in 1906. “The Union,” which sat just across the street from the courthouse site, was the largest and most important mercantile store in Fort Davis, and perhaps the whole county, for decades to come. The Limpia Hotel was constructed just north of the courthouse in 1913, and, soon after, the Fort Davis State Bank, which also housed the local Oddfellows Lodge, was built next to “The Union” just east of the courthouse. At least three blacksmith shops and an auto garage with gas pumps were also built near the courthouse in the early part of the 20th century. This period of construction defined the Fort Davis commercial district, which was centering more and more on the courthouse square (see Figure-20). The Fort Davis Commercial Club, a forerunner of today’s Chamber of Commerce, was established and began advertising the town’s new amenities throughout the region and beyond (Jacobson and Nored 1993: 173-178). The Jeff Davis County Courthouse was rapidly assuming its appropriate role in the civic and social life of Fort Davis and the whole county. When formally opened in March 1911, the courthouse housed a large dance. In 1915 the district courtroom housed the first three grades of the local school. With the advent of World War I, the courthouse was the scene of the first Army Registration Day. Large community dances were held in the courthouse though 1939. Between 1933 and 1939 the sheriff supervised Fourth of July and Christmas dances. The building was also the site of other festivities, including the Fort Davis Study Club Quilt Show in 1932. In 1933 W. D. Smithers was the guest of the Commissioners Court when he was hired to photograph the Scenic Loop (Jacobson and Nored 1993: 223-270; 310). Beginning in 1934, the county initiated a program to replace the courthouse yard’s dying poplar trees with native species. Barry Scobee, who was chairman of the committee formed to oversee the project, began gathering native trees in 1935, and fifty-two had been planted by 1939. In January 1939, with funding and a thirty-man work crew supplied by the WPA, the lawn was leveled and sodded with Bermuda grass and a sprinkler system was installed. Upon completion of the work, Scobee planted sixty-eight more native trees on the grounds. The courthouse square remains a “county arboretum,” with examples of numerous indigenous plants and only three non-native trees (Jacobson and Nored 1993: 291). The Jeff Davis County Courthouse had fallen into disrepair by the 1950s. As discussed in Section 7, major renovations were undertaken in 1956, the most notable of which affected the courtroom. The balcony gallery was removed and the ceiling was lowered to facilitate acoustics and heating, the latter of which was apparently a continuous problem in the large, open space. The courtroom was also furnished with new floors, theater style seats, a plywood judge’s bench and a matching jury box and railing (Jacobson and Nored 1993: 349). As the center of county government, the 1911 Jeff Davis County Courthouse has continued to play a primary role in the community. The building represents the county’s coming of age and its relatively rapid recovery from the loss of its military significance. The construction of the 1911 courthouse marks Fort Davis’ emergence as an important town in its own right, an importance derived from its service as the county’s civic and commercial center. As is intended for a county seat, development, growth, and change within the county have centered on Fort Davis ever since, and the courthouse building is both the ceremonial and practical location from which those changes have been overseen. It is therefore nominated under Criterion A in the area of Government at the local level of significance. The Jeff Davis County Courthouse is also an excellent surviving example of the Classical Revival courthouses built throughout Texas in the early part of the 20th Century. The building’s simple, restrained detailing demonstrates how this style was modified to meet the fiscal constraints of smaller counties without sacrificing its grand presence or democratic symbolism. With relatively few modifications, the Jeff Davis County Courthouse remains a model of this building type and is also nominated under Criterion C in the area of Architecture at the local level of significance.